US low-cost carrier JetBlue hopes to expand its service to Ecuador, with a planned route from New York set to be operated by its new Airbus A321neo aircraft. JetBlue has applied to the US Department of Transportation (DOT) to begin daily service from New York John F. Kennedy International Airport to Aeropuerto de Guayaquil, Ecuador. The low-cost carrier hopes the scheduled passenger and cargo route will begin on or around 5 December 2019 and be operated with a 200-seat Airbus A321neo aircraft. It has requested exemption to operate the service for a minimum of two years and has also asked that the frequency be granted for an indefinite basis. JetBlue added its second route to Ecuador from Fort Lauderdale-Hollywood International Airport on 28 February 2019, with the airline commencing a daily service to Guayaquil using Airbus A320, in addition to its existing daily rotation to the country’s capital Corporación Quiport - Quito International Airport. Guayaquil is Ecuador’s largest city and main port, as well as serving as a gateway to Pacific beaches and the world-famous Galapagos Islands. “The introduction of the A321neo to our fleet opens up a world of new possibilities as we think about the future of our growing network, building out our focus cities, and offering new and unique nonstop routes to our customers,” said Andrea Lusso, director route planning at JetBlue. Currently New York JFK - Guayaquil is only served by LATAM Airlines Ecuador, which flies the 4,797 km route daily using Boeing 767 equipment. However, Eastern Airlines has applied to the DOT to operate the route daily from May 2019 using a 263-seat Boeing 767-300ER aircraft. TAME Linea Aerea del Ecuador also operated flights between Ecuador and New York, but the Quito – New York JFK service ended in late January 2019. The route was served by A330 aircraft. According to Sabre Market Intelligence, O&D demand between New York and Ecuador was 611,254 passengers in 2018, down 6.9 percent compared with the previous 12 months. However, for the wider US-Ecuador market, it increased 1.8 percent to 1.66 million passengers. “On behalf of the Government of Ecuador, and through the Ministry of Transportation and Public Works, we are dedicating efforts to improve the connectivity of our country," said Aurelio Hidalgo, minister of transport and public works, Ecuador. JetBlue's official announcement of its new direct route between New York and Guayaquil by the end of 2019, is the result of this work. We are pleased to receive them, and we wish them success." 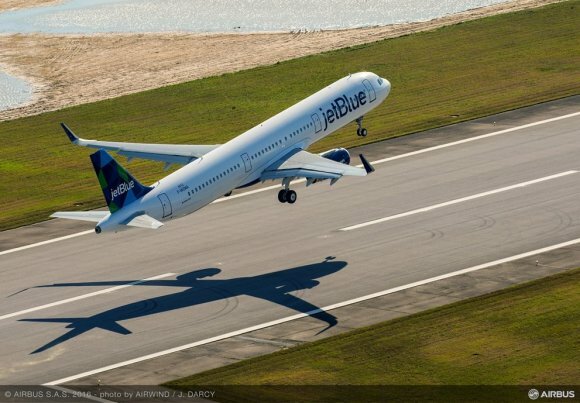 JetBlue currently has orders for 85 Airbus A321neos, with 13 to be converted to the A321LR specification. Last week the carrier revealed plans to launch its first transatlantic flights using A321LR. It intends to offer “multiple daily flights” to London from New York JFK and Boston. The airline is currently evaluating which London airport to serve. Speaking at the time, JetBlue president and chief operating officer Joanna Geraghty said: “London is the largest metro area JetBlue doesn’t yet serve from both Boston and New York, and we could not be more thrilled to be changing that in the years ahead.